Hi all, if you need a simple web interface to execute SEFAutil commands you are in the right place! 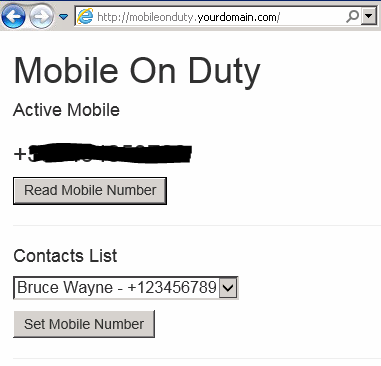 Mobile On Duty is a free SEFAutil Web Interface that help us (you and me) to achieve a simple task: manage the mobile number to redirect incoming calls for a specific Lync/Skype for Business account, for example a week-end Help Desk Customer Support number. The HTML and script execution code is from Roberto Beccari (@trasportation), thank you for your help! If a customer have and issue during week-end, they call +155512345 and the On Duty Technician will receive the call. Mobile On Duty will allow to manage the redirect via web! 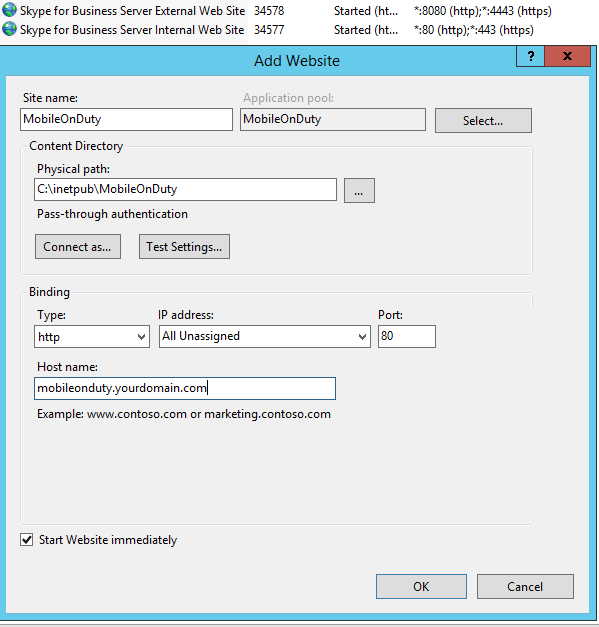 Prerequisites: IIS deployed and .NET 4.0 installed. 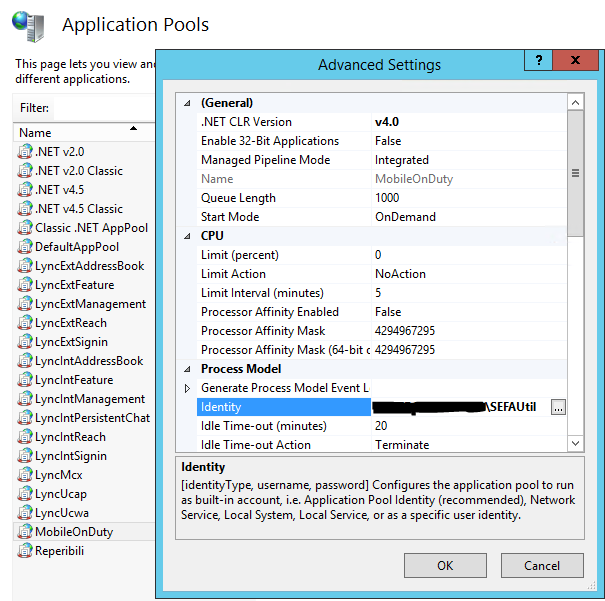 Configure SEFAutil on your Lync/Skype4B environment. You can install it on a Standard Front-End (working but not supported). Extract MobileOnDuty.zip in C:\inetpub on the same server where SEFAutil is installed and where IIS is running. Edit C:\inetpub\MobileOnDuty\Reperibili.txt, it contains the list of Name and Mobile number used on the web page. change <add key=”get.reperibile.parameters” value=”/server:<Pool FQDN> <SIP URI>”/> and <add key=”set.reperibile.parameters” value=”/server:<Pool FQDN> <SIP URI> /setsimulringdestination:%CELL%@centrocomputer.it;user=phone /enablesimulring /callanswerwaittime:30″/> accordingly to your environment. On MobileOnDuty site, click Edit Permissions and in Security Tab add a Domain Group with Read&Execute rights. Members of this Group could access on the site and use it. Now you only need to publish this site, maybe with the help of ARR. If you have created this site on a Lync/SfB Front-End server, remember that it will be stopped every time you run bootstrapper.exe or Enable-CsComputer. After that, simply start again the site. This is a simple page, you can edit it as you need. The use of this page is very simple: when you log in the SEFAutil read command is authomatically executed to retrive the current redirect number. Below there is a drop down list (see Reperibili.txt), choose the On Duty person to forward incoming calls, then click Set Mobile Number. After few seconds you can click Read Mobile Number again to refresh the listed number. 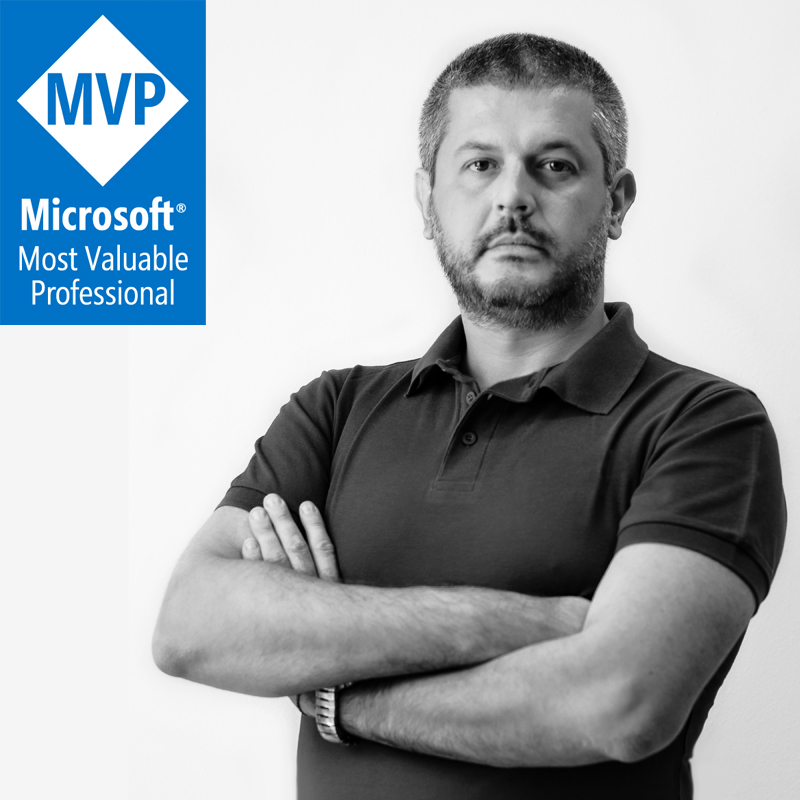 Any chance to get the complete (visual Studio?) project to modify and extend the interface as required? I’ll ask it to my friend and code writer Roberto Beccari. Thanks for your effort in advance! Many thanks to Roberto Beccari for his effort!